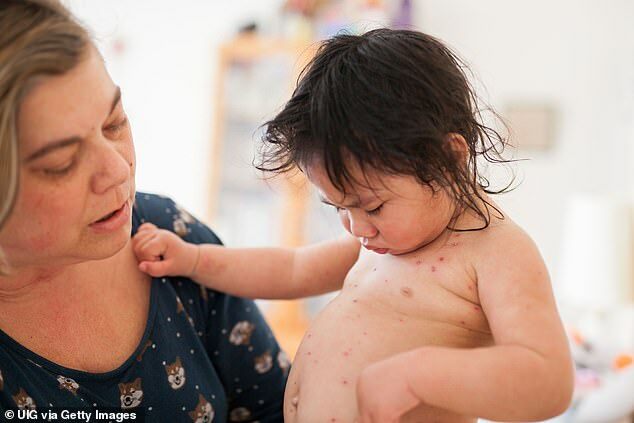 ‘Chickenpox parties’ are said to be on the rise again, but experts warn that the dangers of purposely infecting healthy children with the virus may outweigh the supposed benefits of doing so. Kentucky Governor Matt Bevin recently made headlines after revealing to WKCT that he and his wife had purposely exposed their five biological and four adopted children to chickenpox, all of who are unvaccinated. ‘They got the chickenpox on purpose, because we found a neighbor that had it and I went and made sure every one of my kids was exposed to it, and they got it,’ Bevin said. Bevin went on to say that the kids were ‘miserable for a few days’ after succumbing to chickenpox, but that ‘they all turned out fine.’ It’s unclear how old the children were when they were purposely infected. The Republican governor’s goal was supposedly to help his children gain immunity to the disease, a move that experts are warning against. So-called chickenpox parties, where healthy kids were put into close proximity of infected children, were supposedly popular in the days before a vaccine became available in 1995. Parents who participated in the pox parties then and now are said to believe that by ensuring that their kids got and then fought off the chickenpox when they were young, they wouldn’t catch it when they were older and less able to get over it. Vaccines typically contain weakened or killed forms of disease microbes. When introduced into the body, the immune system recognizes the microbes and then destroys them, learning to do the same anytime those microbes reenter the body down the line. As such, vaccines are seen as a safe way to boost the immune system, unlike exposing people to the virulent airborne version of the disease. ‘Some kids will just get a few [chicken pox], some will die. You just don’t know, so we vaccinate everyone [we can],’ Burgert said. The Centers for Disease Control agrees with that sentiment. The apparently growing antivaxxer movement has gained more attention in recent years, particularly in the wake of measles outbreaks around the country over the past year. Measles had previously been considered eliminated in the US in 2000, thanks to general measles vaccinations and corresponding herd immunity.